Melbourne is set to become so choked by cars in coming decades that the average speed during the morning peak will drop to just 31 kilometres an hour – even with billions of dollars of planned road and rail upgrades. In a depressing analysis of the challenges facing Australia’s fastest growing city, Infrastructure Victoria bluntly warns it will be impossible for Melbourne to build its way out of congestion. Ramping up the case for a new regime of road pricing to better manage demand by replacing the inefficient and unfair melange of charges faced by motorists – including fuel excise, rego fees, licence fees, stamp duty, tolls and parking fees – the infrastructure adviser warns frustrations for drivers and public transport users will only grow. “Building more transport infrastructure to fix road congestion without managing demand is financially and environmentally unsustainable,” the report says. 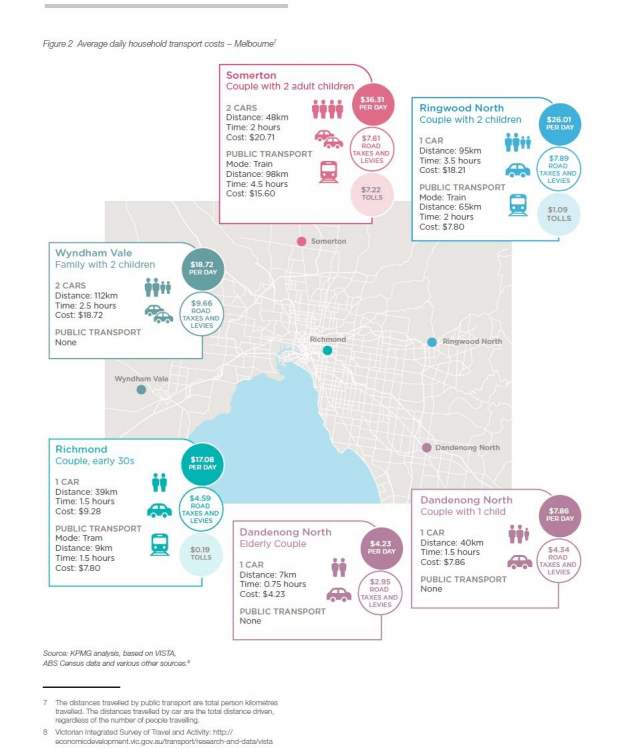 Within two decades, half of all car trips in Melbourne are expected to be “significantly” affected by congestion. That’s even with billions of dollars of planned upgrades, including to the M80 Ring Road, CityLink, Melbourne Metro, the Western Distributor and the Level Crossing Removal program. As it is, about 30 per cent of car trips today happen on congested roads during the morning peak. But by 2046, the number of daily trips made on the transport network is expected to soar by 74 per cent. The report, suggesting state and federal governments could be forced to take some tough political decisions in the near future, found congestion is already costing about $4.6 billion a year. But this is expected to more than double to $10.2 billion by 2030. It said within 15 years, delays caused by traffic snarls will be costing every Melburnian an average of $1700 a year more than under a scenario where traffic could move more freely. By 2046, congestion in the west will be so bad the roads will resemble the inner city today, while Melbourne’s north will be even more congested. And while it already takes an hour to drive from Epping to the city, within two decades it will take an hour and 45 minutes – equivalent to more than a working day spent in the car battling traffic each week. At the same time, the average speed during the morning peak will be expected to drop to 31km/h by 2046, compared with 38km/h currently. The report found that even with about $40 billion of extra investment in road and road over the next three decades – including the Outer Metropolitan Ring Road, the North East Link, a proposed City Loop Reconfiguration, an Airport Rail Link and a second stage of the Metro Rail Project, road congestion would still increase dramatically. Infrastructure Victoria chief executive Michel Masson said a new road pricing regime was badly needed to better manage demand. “Road pricing should not be another tax – it should replace, reduce or streamline existing fees and charges, creating a fairer way of paying to use the road,” Mr Masson said. He said it would be impossible for Melbourne to build its way out of the problem, given the rate of population growth. The report follows a decision by the Turnbull government this week to launch an investigation into road pricing. One of the Federal government’s main worries is that the fuel excise regime is linked to fuel use. With increasingly efficient vehicles, and the growing potential for electric cars, the revenue source is likely to decline.